Summarizing and Reflecting on the 2015-2016 “State of the Software Testing Profession” Report by TechWell. Yet another survey report on the state of software testing has been published, this time by TechWell called, “The State of the Software Testing Profession 2015-2016.” You may be wondering, is it worth the read? If you read it and don’t learn anything new, you’ll end up wasting your time. On the other hand, if you don’t read it, you won’t know if you are missing out on some interesting information that you can use to make decisions in your team, company or career. Well, this post has you covered! I’ll provide a summary (with an infographic) that includes the findings and facts that were most noteworthy to me so that you don’t miss any useful information from this report yourself! The report analyzes the results from a survey that TechWell conducted in which 529 software professionals including testers, managers, developers, analysts, and consultants participated. It sheds light on and confirms some of the things that I see are already happening in the testing world and (to get straight to the point) it leads us to this conclusion: Testers are evolving to survive in new development environments and are adapting their roles to better support them, bringing their unique skills to the table and learning new ones. The respondents almost unanimously believed that as long as humans are accountable for software, we will need testers. Moreover, 75% of participants support “tester” remaining a distinct role within a team and 91% agreed that the role of a tester must be transformed to meet the needs of today’s software development projects. These statistics come as no surprise to me! There are several big names in testing that feel this way too. For example, Rosie Sherry, founder of the Ministry of Testing, also claims testing is adapting rather than dying. In this post, she shares a mindmap of the future of testing, showing all of the ways in which she foresees testers may evolve. Almost half of the respondents reported their organizations had added testers within the past twelve months and looking ahead another twelve months, 71% of respondents expected their organizations to continue to employ testers. I can certainly say this is true for Abstracta as well. In 2015, we nearly doubled our testing staff and we plan to employ more testers than ever by the end of the year. The report concludes that testers will start directing more of their efforts to agile testing, test automation, and non-testing responsibilities. Regarding automation, almost 70% of participants said they were automating more at either the unit or system level. While 41% responded that they will develop technical automation skills, other career development areas most reported were management and leadership (45%), domain or business expertise (35%), and proficiency in agile practices (25%). This falls in line with what we have seen within our own organization. At Abstracta, when our clients work within an agile environment, we urge our testers to get involved in an array of matters to support the development process from day zero, starting with planning activities all the way through to the inspection and adaptation activities. We’re also proponents of continuous education. Our testers try out new tools all the time and after learning them, if they recommend them, they host sessions in which they review them with their colleagues and train each other on how to use them. We also have created online training courses and certifications in English and Spanish for our in-house testers and any other testers and devs who want to improve their skills from all over the world. According to the report, the majority of testers really do like testing! In the survey, 75% of testers reported they want to continue on the software testing career path. Only 10% said they wanted to call it quits and 15% were undecided whether they want to stay in testing. At Abstracta, we were founded by testing fanatics who couldn’t imagine doing anything else, so we fully resonate with this part of the study. As a part of the growing shift that many organizations are making to DevOps, half of the respondents were or had planned to implement continuous integration in the next twelve months, half implementing continuous testing, and one-third were starting to or are already utilizing Continuous Delivery. We have been asked by several clients to help them overcome the challenge of implementing continuous integration as a part of a more mature testing strategy. 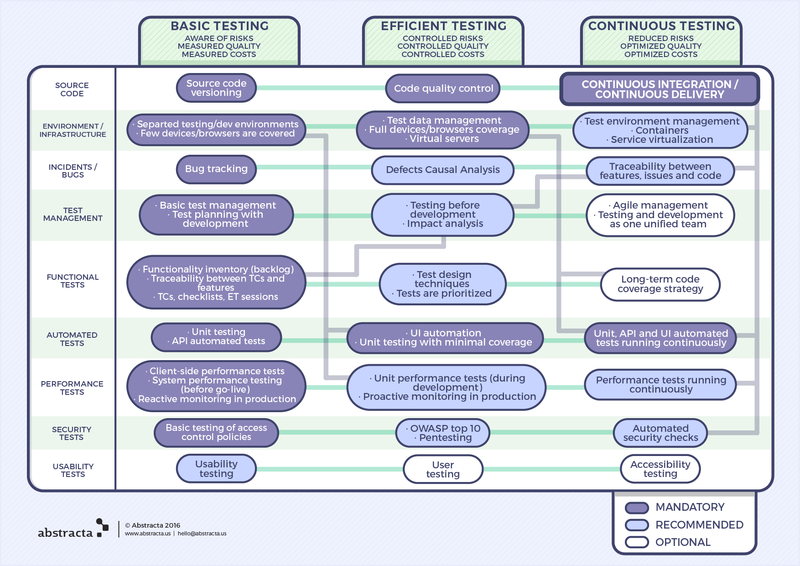 We even developed a testing maturity model with which we can assess the maturity of an organization’s testing processes and can recommend ways to shift testing left, starting sooner in the development process rather than later. This way, software is developed quicker, but without rushing it out the door untested. According to the survey, mobile was also a top challenge for testers. The majority of respondents were doing some sort of mobile testing, but only 25% felt they were equipped with all the knowledge, skills, and tools they needed. In particular, some of the challenges cited related to mobile were the availability of tools, such as emulators; ability to automate mobile tests; having enough testers with knowledge of mobile; and schedule and budget limitations. One of our favorite types of testing at Abstracta is mobile testing, so to help others face the challenges that it brings, we created our own Android testing tool, Monkop. It allows you to test your app on real, relevant devices for performance troubleshooting and tuning, detecting security vulnerabilities, and functionality. 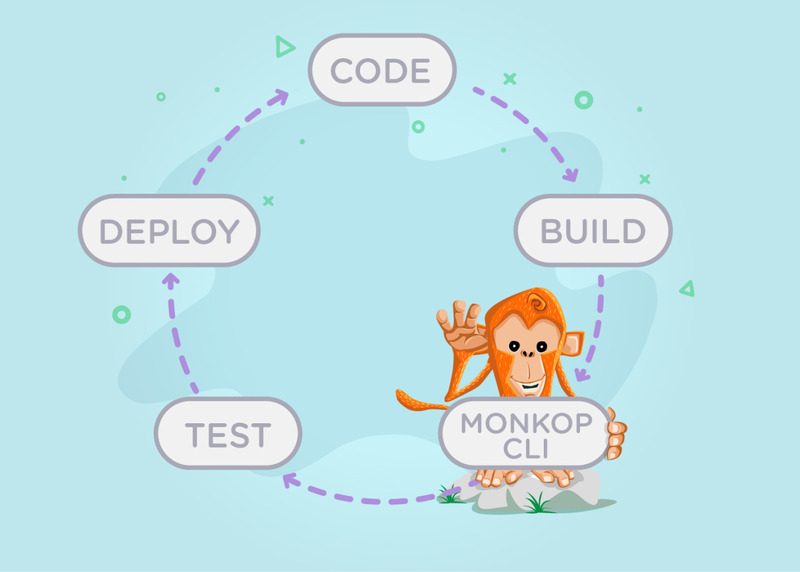 We recently created a new version, Monkop CLI, to help automate testing into every build, enabling you to run crash and sanity tests on real devices with no effort! It is also now fully integrated with Travis CI, another continuous integration tool. 51% of survey respondents said the number of post-release defects was down and 43% reported an improvement in the quality of development builds. This seems like a natural outcome of the shift to continuous integration. It seems that not only is testing not dying, but it is improving! The quality of the world’s systems is better than ever and will continue to experience fewer and fewer defects as testers and developers continue to work together to streamline QA along with development. This report has confirmed what we believe about the state of the software testing profession at Abstracta as well as the trends that I’ve noticed in the world of software development and testing. The need for testers isn’t go away, but they must adapt to new iterative approaches of software development and find activities and ways in which they can continue to provide value. Even testers who find themselves in organizations that follow a waterfall approach should start preparing to evolve because it is likely that they will find themselves in agile and similar environments in the future. If you want to read the full report, you can download it from StickyMinds. What do you think? Do the results surprise you or do you think they adequately portray the software testing profession today? Published at DZone with permission of Federico Toledo , DZone MVB. See the original article here.